You have the power to ignite positive change. Be a leader in your field, whether you’re a classroom teacher or a building-level administrator. Best practices for balanced systemwide assessments require collaboration and strong leadership at every level. 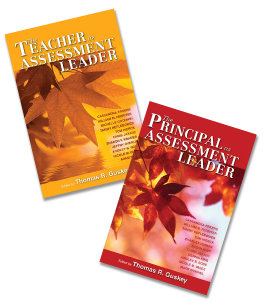 Add these two anthologies to your professional library and create a united team of school leaders focused on powerful assessments that inform instruction and raise achievement levels. Order these two books as a set and save $4.95! Meaningful examples, expert research, and real-life experiences illustrate the capacity and responsibility every educator has to ignite positive change. Packed with practical strategies for designing, analyzing, and using assessments, this book shows how to turn best practices into usable solutions. Filled with first-hand experiences from expert practitioners, this book delivers the motivation needed to ignite a shift toward formative assessment and overall school improvement through building teacher literacy, providing targeted professional development, acquiring appropriate technology, and more. This study guide is arranged by chapter, enabling readers to either work their way through the entire book or to focus on topics addressed in a particular chapter.